An EPIC SURPRISE: AN AMAZING Choreographed Wedding Dance Like You've Never Seen Before. Surprise Groomsmen Dance for Alex Groom and his groomsmen surprise the Bride with a dance lip sync to What Makes You Beautiful by One Direction. 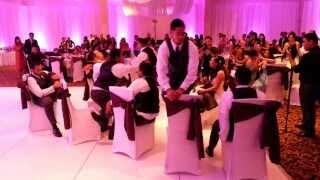 The Groomsmen Surprise New Bride with an Epic Dance Set! was added to our system January 1, 2015. This viral videos does not rank in our top 100 submissions. She Planned Her Own Proposal and Didn't Even Know it!! Hilarious Bride and Bridesmaids Surprise Wedding Dance!